Join me in conversation with Aliya Whiteley and Montague Kobbé on Monday evening at The Victoria Library, Westminster from 7pm. This will give you a chance to hear them both read excepts from their new books, as well as put your questions to them. Tell us if you are coming along! Aliya Whitely launches her latest novel, Skein Island: Marianne Percival has been summoned to Skein Island by its owner, the reclusive Lady Amelia Worthington. There’s only one problem – Lady Worthington has been dead for years. So who wrote the summons? And what does it have to do with the disappearance of Marianne’s mother? All the answers lie on Skein Island. It’s a retreat, and it holds many strange relics from a time of heroes and villains. At its centre stands a library that holds the stories of thousands of women. And underneath the library there is a secret that Amelia Worthington kept from the world. A secret that is about to be uncovered. Montague Kobbe launches his collection of micro-fictions, Tales of Bed Sheets and Departure Lounges: Fifty bilingual micro stories strung together by emotional ties progressively weave a sense of reality that is both drastically different to that expressed in each individual tale and at the same time shared—perhaps even created—by the entire collection. The conventional tropes of love and lust, travel and sleep are deliberately approached with awareness of the tradition and a dose of provocation, sending the reader on a dangerous path along the outer edges of the cliché, hanging by the thread of irony and humour over the abyss of the banal. Form is central to a concept in which the short story has been boiled down to its most fundamental core: action. In this sense, context has often been totally or partially removed, giving primacy instead to the verb and its echoes, both within the collection and in relation to literary tradition. Equally central to the concept is the role of sound. When I received this quarter’s Mslexia, I laughed. Very loudly. Continuing Mslexia’s feature of guest editors, Suzi Feay and the Mslexia team have made a bold statement with the June/July/August edition. Featuring two gingerbread women, clearly in love, with the title “Dyke writers. What’s the problem?” As thought provoking and daring as the title is, my laughter subdued as I read the Agenda article. Feay has shed light on the fact that there is a problem: not enough “dyke writing”. Although I identify as a lesbian, I am a writer, editor and reader: not a lesbian writer, -editor, -reader. Perhaps the lack of lesbian writers (lesbian author, lesbian content) is because more women are identifying themselves in a similar manner (?). I was startled to find novels in which lesbian characters were stereotyped as murderers or or deranged, or in which a character’s sexuality turned out to be the ‘twist’ in the story (as opposed to an unremarkable aspect of someone’s life). There are writers, of course, who create lesbian characters who do not fit into stereotypes as above. However, I agree with Feay, they are the same few again and again. Which leads me to my main interest in the article; there is a distinct lack of “L in LGBT” writers going for the Polari prize and others, as well as within mainstream publishing. From an indie perspective, I’ve noticed the same whilst forming a long-list of authors to get involved with the Fruit Bruise Press anthology – there are a lot of male writers with diverse backgrounds getting in contact with us, but very few women; whether lesbian or not. At Fruit Bruise, we’re working towards promoting and supporting the transgressive, emergent, and excluded writers and I’d love to hear from lesbian writers who would like to be involved with the anthology and future programme for literary development. Following from Feay’s question, I’d like to ask “Is there anyone out there? Discover more about Suzi Feay and her writing here: www.suzifeay.com. 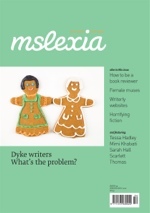 And find out more about Mslexia and the latest edition: www.mslexia.co.uk. If you would like to know more about Fruit Bruise Press and discuss writing with us, please contact me below or at lexi @ doghornpublishing . com. 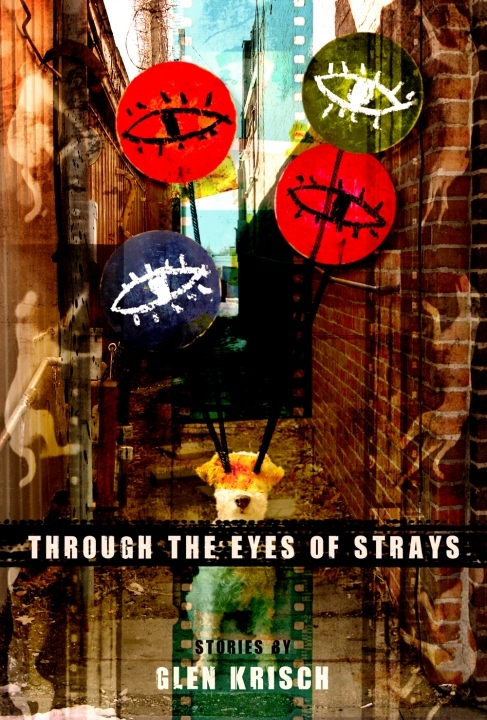 Released into the big bad world yesterday, Through the Eyes of Strays is a collection of Glen Krish’s best short stories from the past twenty years. Full of speculative, gut-grabbing, mind-expanding tales, this is a collection you will not want to put down – I’m certain there is something for everyone in this! Society’s loners observing, and in some cases, changing the status quo. An agoraphobic woman is forced to face a ruined world after months of isolation. A father faces the death of a child in a world where genetic perfection has done away with such traumas. A lovelorn man searches for the perfect woman and, ultimately, finds himself. A nameless drifter absorbs people’s pain, the filth rotting their souls, until one day he can no longer bear this burden alone. In these and many more stories, Glen Krisch crosses genres, disrupts and disfigures them, until something entirely its own rises from this alchemical brew. Published by Dog Horn Publishing, it was a fantastic project to work with and edit, Glen has introduced me to characters and hidden stories that cannot be found elsewhere. You can purchase the trade-size print edition from Lulu. If you’d like to find out more about Glen’s work, check out his website and blog.